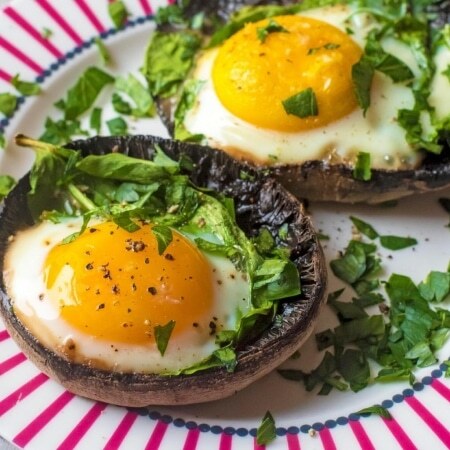 Eggs are always an easy go-to when it comes to a filling breakfast, and these Eggs Baked in Portobello Mushrooms are perfect for a low carb Sunday brunch, or breakfast when you have a little bit more time to cook your eggs. 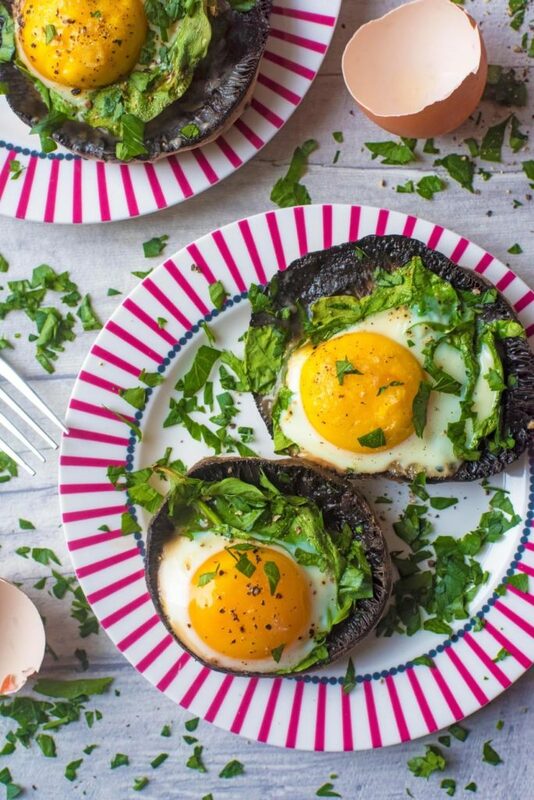 Protein packed eggs, baked in a mushroom for a low carb alternative to putting them on bread and a layer of chopped spinach for a vegetable portion first thing. This is one of our favourite low carb breakfasts. You just add some greens to a large mushroom cap, crack an egg in to it, season and put in the oven until the egg is cooked to your liking. There are so many ways you can adapt this recipe too, with different vegetables or even some chopped up bacon. Whilst the eggs are really the star of this dish (I mean, look at that yolk), I think we need to give a bit of praise to the mushroom. Not just in this dish, but in all dishes! They have a real meaty texture and are a great source of vitamin D, Iron and Potassium. What we love most about mushrooms, portobello mushrooms in particular, is that they make a great base or carrier for other ingredients to create a delicious and light meal. 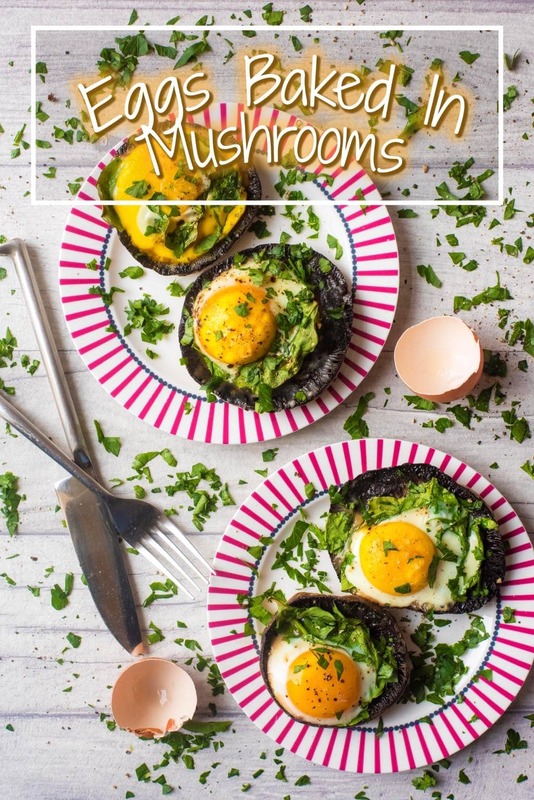 Not only are they the perfect size to crack a medium egg in to, but have you tried our Portobello Mushroom Pizzas? The perfect quick and easy low carb pizza option. When I asked you guys what kind of recipes you wanted to see more of, low carb breakfast options was a popular one. Whilst I am totally not anti-carbs (hello potato obsession), starting the day with a carb heavy meal can make me feel more like having a nap than taking on the day. 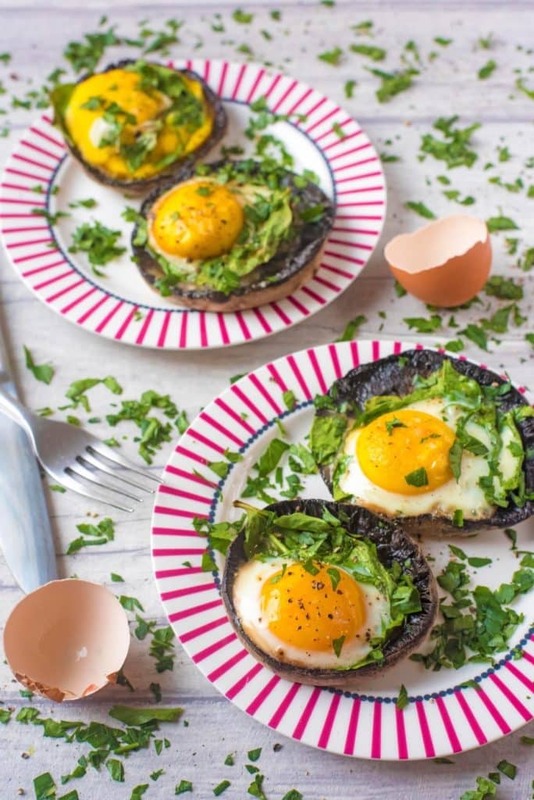 It can be so easy to just grab some toast for a quick breakfast, but low carb options can be filling too, and these Eggs Baked in Portobello Mushrooms definitely are! Mushrooms are nice and meaty, and also fairly solid so they make a good base and bread substitute. What Else Can You Add To These? I think these are a pretty impressive brunch option to serve to a crowd, if you want something that takes almost no effort at all. The great thing about them is that they are so easy to adapt. We just added loads of spinach, as our green vegetable intake has been a little on the low side recently, but you could add peppers and onions or even some ham/bacon if you want meat in them. If you wanted to jazz these up even more, then add some cheese on top and they are kind of like breakfast mushroom pizzas. These are a great way to use up leftovers. One: Peel the portobello mushroom caps “skin” so they are no longer dirty. This is better than washing them, as they would absorb water. Two: Place on a baking tray, stem side up. Three: Divide the spinach between the mushrooms. 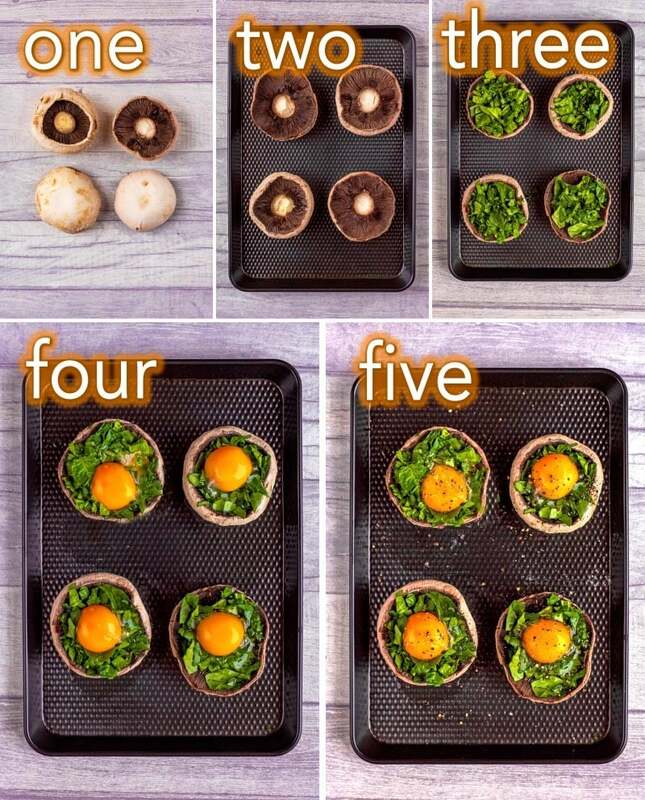 Four: Carefully crack an egg in to each mushroom. Five: Season with salt and pepper and bake in a preheated oven at 200C for 15-18 minutes, until the white of the egg is cooked. Use the best quality and freshest eggs you can, as it will make a difference. You don’t have to use spinach in this, you can swap it for other leafy greens like kale. Want more of a meaty dish? Add some chopped cooked bacon at the same time as the spinach. 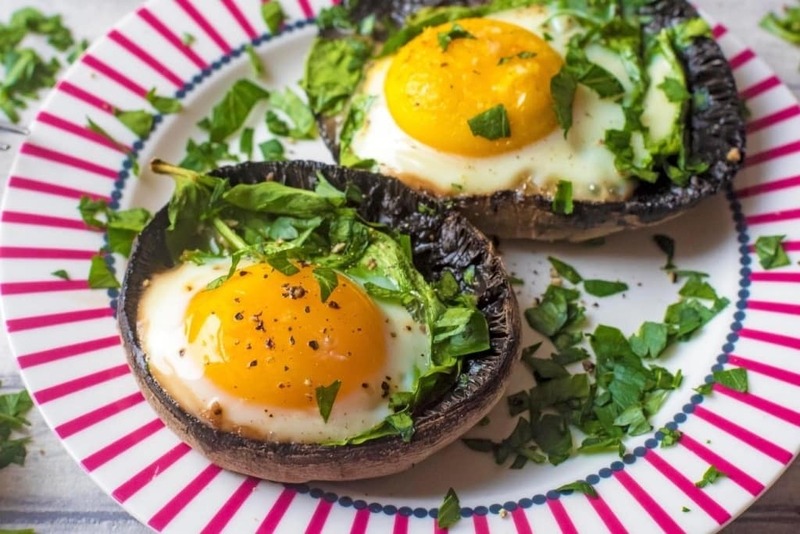 Eggs are always an easy go-to when it comes to a filling breakfast, and these Eggs Baked in Portobello Mushrooms are perfect for a Sunday brunch, or breakfast when you have a little bit more time to cook your eggs. Peel the portobello mushroom caps so they are no longer dirty (this is better than washing them so they don't absorb water) and remove stem. Divide the spinach between each mushroom and then carefully crack an egg in to each and sprinkle with salt and pepper. Put in a pre-heated oven at 200C and cook for 12-15 minutes until the whites of the egg are cooked. Sprinkle basil on top before serving. You don't have to use spinach in this, you can swap it for other leafy greens like kale. This post was originally published on 30th April 2018 and updated on 1st April 2019.
wow this is beautiful!! I’d love to give this a go!!! my husband would love if I made him that for breakfast! OMG! 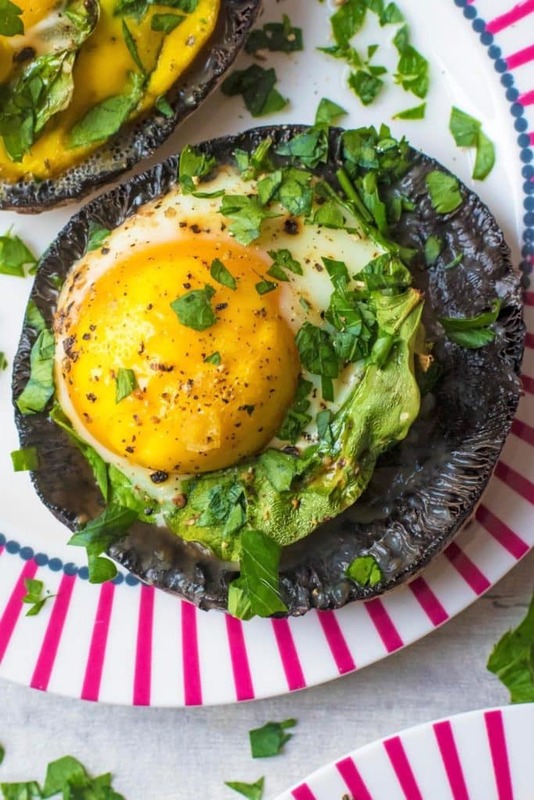 These eggs baked in Portobello Mushroom looks really delicious and it makes me feel so hungry. I will absolutely try this recipe, my hubby would love this for sure. What a fab idea!! I haven’t seen this done like this before, they look great and Im sure they taste delicious! These sound fantastic, I love eggs, and I love mushrooms so what could be better. 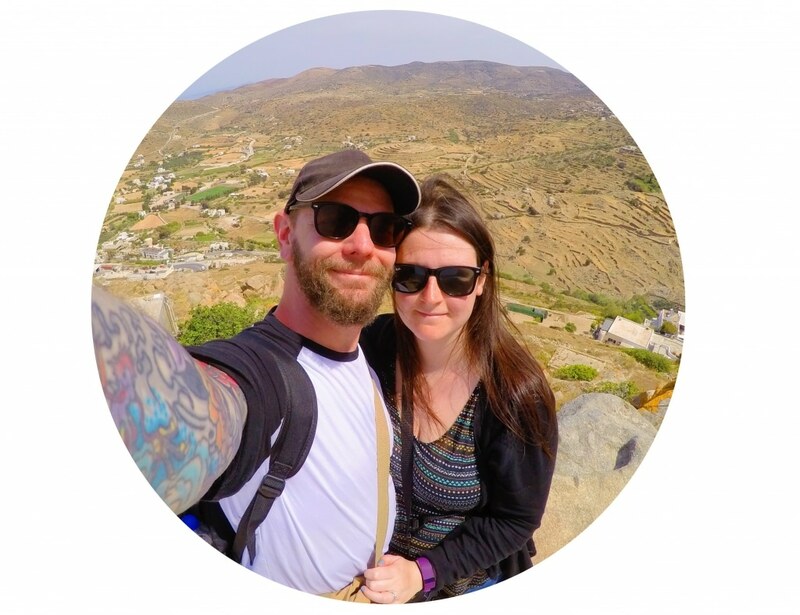 You always make it sound so much more exciting and easy to do.